This is what the Lord says: "You say about this place, 'It is a desolate waste, without people or animals.' Yet in the towns of Judah and the streets of Jerusalem that are deserted, inhabited by neither people nor animals, there will be heard once more the sounds of joy and gladness, the voices of bride and bridegroom, and the voices of those who bring sacrifices of praise to the house of the Lord, saying, 'Give thanks to the Lord Almighty, for the Lord is good; his love endures forever.' For I will restore the fortunes of the land as they were before," says the Lord. . . .
"The days are coming," declares the Lord, "when I will fulfill the good promise I made to the house of Israel and to the house of Judah. In those days and at that time, I will make a righteous Branch sprout from David's line; he will do what is just and right in the land. In those days Judah will be saved, and Jerusalem will live in safety. This is the name by which it will be called: The Lord Our Righteous Savior." As the soldiers led him away, they seized Simon from Cyrene, who was on his way in from the country, and put the cross on him and made him carry it behind Jesus. A large number of people followed him, including women who mourned and wailed for him. 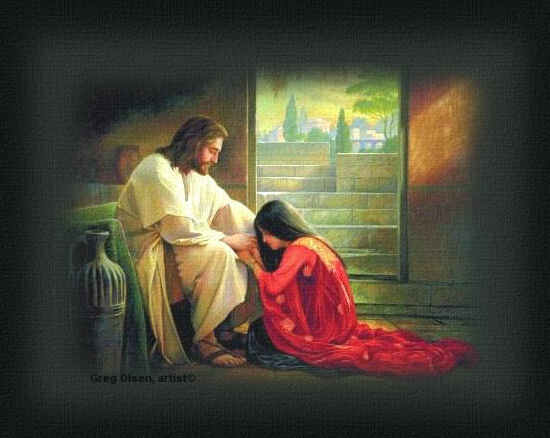 Jesus turned and said to them, "Daughters of Jerusalem, do not weep for me; weep for yourselves and for your children. For the time will come when you will say, 'Blessed are the childless women, the wombs that never bore, and the breasts that never nursed!' Then they will say to the mountains, "Fall on us!" and to the hills, "Cover us!" For if people do these things when the tree is green, what will happen when it is dry?" Two other men, both criminals, were also led out with him to be executed. When they came to the place called the Skull, they crucified him there, along with the criminals--one on his right, the other on his left. Jesus said, "Father, forgive them, for they do not know what they are doing." These days, people generally believe that the [ancient Jewish] burnt offerings and sacrifices were symbols of the Lord's passion, and that by his passion the Lord atoned for the sins of all people. Indeed, people believe that he took these sins on himself, and thus bore them himself, so that those who believe are made righteous and are saved, if only they think, even in the last hour before their death, that the Lord suffered for them--no matter how they may have lived throughout their entire lives. But such beliefs are mistaken. The passion of the Cross was the most severe temptation that the Lord endured. Through it he fully united the Human to the Divine and the Divine to the Human, and in this way glorified himself. That union is the means by which people who have faith in him that is grounded in love can be saved. For the supreme Divine was no longer able to reach the human race--which had moved so far away from the heavenly things of love, and from the spiritual things of faith, that people did not even recognize them anymore, let alone perceive them. Therefore, so that the supreme Divine could come down to all people who are like this, the Lord came into the world and united the Human to the Divine within himself. This union could not have been accomplished except through very severe conflicts in temptations, and through victories in these, and at last through the final temptation on the Cross. As a result of this, the Lord is able from the Divine Human to enlighten human minds--even with people who are very distant from the heavenly things of love--as long as they have within them faith that is grounded in love. In the popular rock musical Jesus Christ, Superstar, as the figure of Jesus remains unmoved in the center, the crowd anxiously milling around him asks the question, over and over again, "Jesus Christ, Jesus Christ, who are you; what have you sacrificed?" In ancient Judaism, the sacrifices were literal: animals were slaughtered and burnt, in part or in whole, on the altar in the tabernacle, and later in the temple at Jerusalem. These sacrifices were strictly commanded in the Law of Moses, and were considered to be the holiest act of worship--the core of the Israelites' devotion to the unseen God. They viewed that God as, yes, a merciful God, but also as a God who could burn with anger, and whose anger needed to be placated by the soothing aroma of burning animal flesh rising up to God in heaven on columns of smoke from the altar of burnt offering. For those people who lived thousands of years ago, whose focus was entirely en external, physical things, these sacrifices were a very concrete and visual reminder that God was present in their lives, and that his commandments must be obeyed. It is not the physical sacrifice that God wants, but rather, the humble acceptance in our minds of God's commandments, the open acceptance in our hearts of God's love, and the willing obedience of our hands to God's will. And these human realities are exactly what the ancient sacrifices signify in their deeper, spiritual meaning--in the meaning that relates to our inner, spiritual life. The external sacrifices of slaughtering and burning animals was never God's intention. This was simply a practice that already existed in the ancient cultures to whom God spoke in the days when the Old Testament was being formed and written. God used the sense of the sacred that those people living thousands of years ago had attached to these burnt offerings, and turned their hearts toward him by making those sacrifices meaningful in the service of the Lord of all, rather than in the service of the many pagan gods that these people would otherwise have worshiped. He did not attempt to violently uproot the acts of worship that they viewed as sacred, even though these were not pleasing to him in themselves. Rather, he accepted them for the spirit of obedience and reverence in which they were given. Those sacrifices did have at least one virtue: They were concrete, physical, and visible even to the most materialistic of human minds. And we humans do seem to need physical demonstrations of the subtle, spiritual realities of God's love and truth. Especially when we first start out on our spiritual path, we find these deeper things to be wispy and shadowy, hard to grasp and appreciate. So even though God really desires change in our hearts and minds, he shows us the way through outward signs and symbols of the higher realities of love and wisdom that are God's presence in us. He gives us outward, physical demonstrations, right in front of our eyes, of the deeper realities of his love. And he does this because he is determined to reach out to us and love us . . . no matter what it takes. And so it was an act of infinite divine love that brought the God of the universe to us in physical, tangible, human form as our Lord and Savior Jesus Christ. In the poetic language of prophecy, God's supreme, burning love is expressed through the human appearance of burning anger and wrath. And God's own arm expresses the physical reality of the Lord appearing in the material world as the Son of Man, the human-born one, our flesh-and-blood Lord, Jesus Christ. When there was no prophet left, no priest left, who could reach through the thick, dark, hardness of human hearts that had abandoned themselves entirely to the material world and its pleasure and pain, the Lord did not abandon us to our materialistic self-destruction. He did not stand idly by in his place of divine bliss and allow us to rush unchecked into the eternal death and destruction of hell. He could not stand by, and still be a God of love. When God saw that we were heading to our own destruction, that we could no longer hear the voice of God's love calling to us from within, he did not, he could not abandon us. He loved us too much for that. He loved us with an infinite love. And so he sacrificed his own pleasure and his own bliss, and came to us here in our dark, cold, and evil world. He became as human and physical as we are, and suffered through the last dregs of evil and bitterness that fallen human beings, and all of hell, could throw at him. He allowed himself to suffer the ultimate agonies of rejection and death at the hands of violent human beings who had utterly turned themselves away from his love. This was the extent and greatness of God's love for us. This was what God, in Jesus Christ, sacrificed for us. 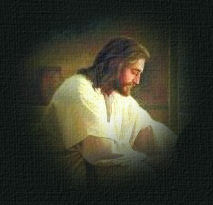 He showed that no matter how violently we hate and reject him, his love is stronger than our rejection. He forgave us even as we were crucifying him. He loved us even as we were putting him to death. Jesus Christ. Who is he? He is God with us (Isaiah 7:14; Matthew 1:23). What has he sacrificed? He has sacrificed himself, given himself completely to us, in love. Amen.